Besides the basic items I need a few special tools like the correct size sockets for the wheel axles and such. The tires need replacing $$, the chain and sprocket are toast $$ and the brakes don't feel so hot $$. Lucky me I found a person willing to help me out with my conversion. He sure has one tricked out Aprilia Mille R but he hit a spot of bad luck (engine trouble) and elected to part it out. I can't thank him enough! We sparked up a deal for the Ohlins suspension, steering head bearings and triple clamps for the smaller diameter forks. I definitely would have rocked his OZ rims as well but all that other stuff sold rather quickly and I basically was operating on borrowed money at that time. So let's get the rear Ohlins installed. First of course you want to take all the body work off the bottom and sides of the Aprilia. Scratching any of the stuff will ruin your day and it's super easy to take off. 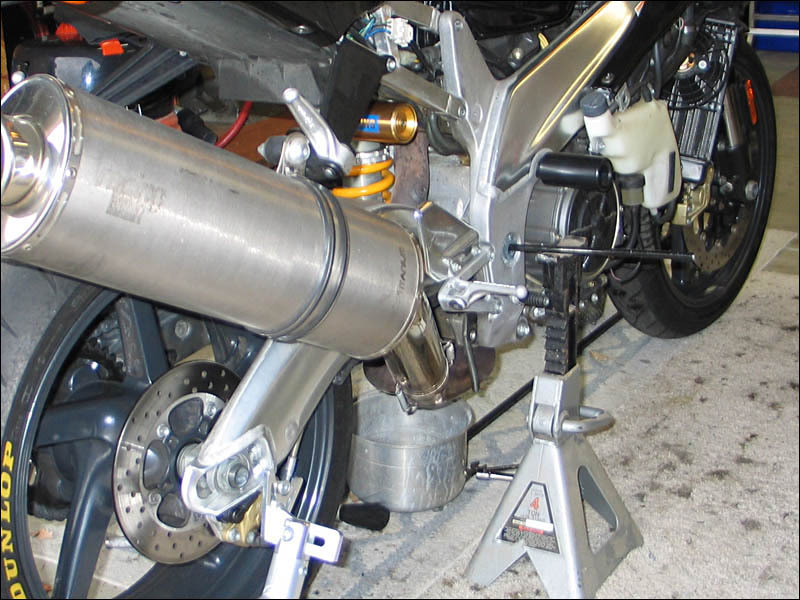 Next you need a metal rod to run through the motorcycle frame to hold the bike up. I found one this morning and cut it to length enough so that the jack stands would easily hold it up from each side. I just raised the bike on the Lockheart Phillips rear bike stand I have and set the jack stands to both sides to hold the bar. Then you just simply remove the rear bike stand and it should easily come to rest on that stands off of the ground. The metal rods bowed a little bit but it was still really stable. 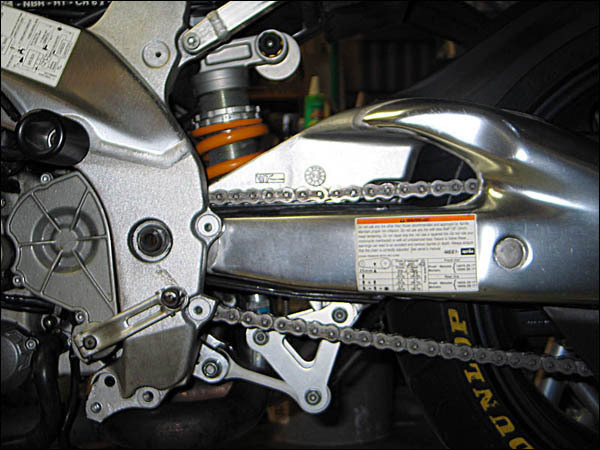 I then removed the rearsets with a 10mm to gain easier access to the area. 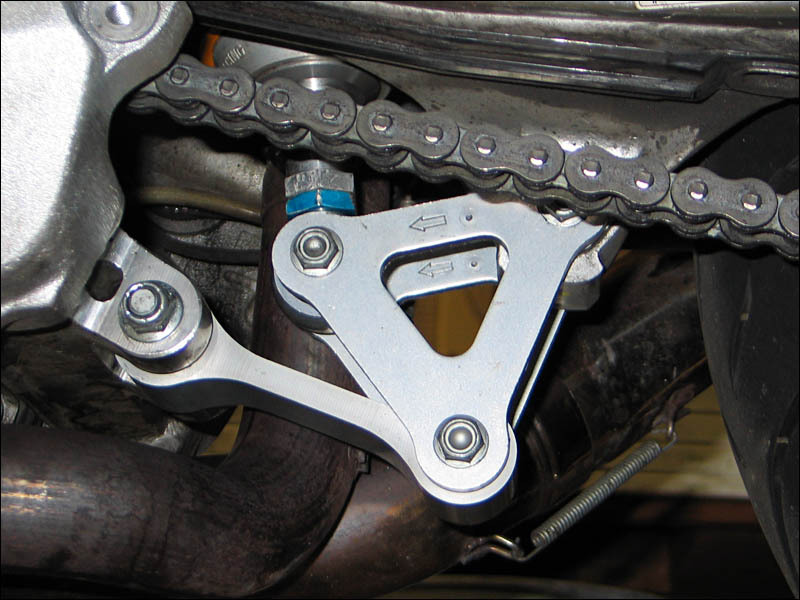 You simply remove the 15mm nuts that hold the triangle shaped linkage and get ready to pull out the long bolts that hold it all together. I jiggled the rear stand under the rear swingarm spools which took the pressure off of the linkage bolts. This easily let me pull them out. 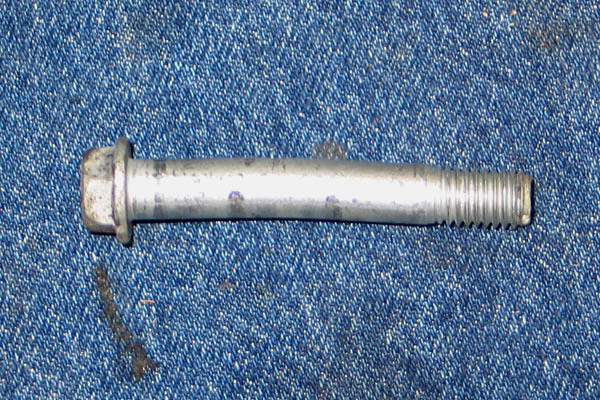 Then the top of the shock is held in by a 15mm nut on an allen bolt. The bottom is held by the same. A basic ratchet, extension and sockets were all I needed. Here is the bottom Ohlins shock linkage all in place and cleaned up. I checked out the needle bearings and cleaned the seals before placing them back in. The torque is stated to be set at 38ft lbs. last time I checked. 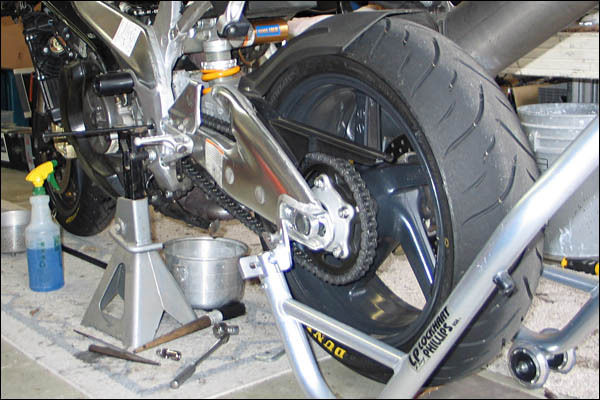 So once you remove all the bolts the shock will come out from above the swingarm once you completely lower the wheel and let it hang down as far as it drops. It doesn't have to drop down too much as you can see that I did this whole shock swap with only the rear bike stand lifting it up. When you have the bolts out make sure and inspect them all. Luckily my friend back east send me all the linkage plates and bolts from his parts bike along with the Ohlins shock. I didn't notice how badly bent one of my bolts was for a few minutes but it eventually caught my eye and surprised me. Do NOT put any deformed bolts back into your shock assembly! Here is another picture or two of how I set things up to do the work. I read forum posts of people using ropes and doing some weird things but I was able to do it really easy with just a minimum amount of tools. B) They really nail you for a few hundred if you take it to a dealership to do something like this. It's SOO EASY! and you know you will do a better job and clean things up while you swap the parts out. Aprilia Mille RSVR shock replacement, mission complete. If you are about to change out your shock or service the bearings and bushings make sure and check out Joe's webpage. More info on the subject won't do anything but help you learn more before you dive in. Safety first.... EVERY ONCE AND A WHILE check your link plates and the bolts that it hinges on!!! This is very important stuff. As you can see this thread is basically the start of my transformation to an RSVR from the RSV I had bought. All in all I have lost money by upgrading everything to RSVR status but the experience was worth it. There is a ton of info here on everything I did. I went above and beyond what was needed to upgrade to just a typical RSVR and I have basically made a dream bike I have always wanted. Mark that one off the list! I wouldn't have a problem picking that 02 RSV up for $4,500. It's got some NICE upgrades and the stands are worth something to you me too. I bought mine for 4,000 (flawless body but 19K miles and slightly bent from rim from a curb) and you rarely see them for less than 5K in that good of shape. In general the fuel tanks are pretty tough so you have nothing to worry about from just a little rash. Of course I would have to take a closer look to give you a more worthy opinion. But being how they are the most expensive piece of bodywork and the swing is dented a bit you could offer the guy 4 grand and walk away with a clear conscience that you offered him a fair price. As far as the bike being road ready that looks like a really good one. 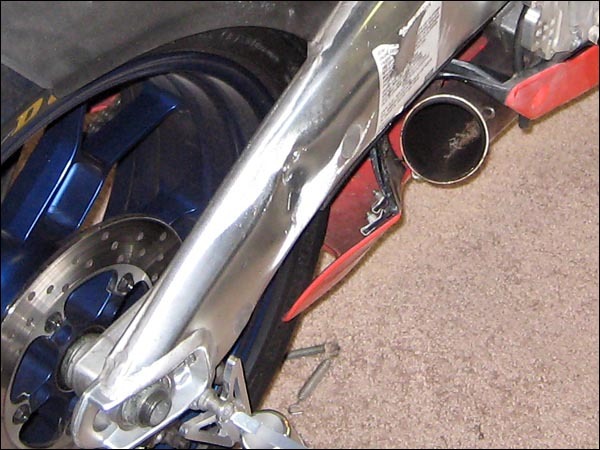 I dented my swingarm pretty good and there is no way I'm going to spend a few hundred on a new one just to make it look better. I measured the arm in a few different spots to make sure the axle and wheel were located where they should be, not skewed or angled in any way. So I know the wheel is straight. I have put mine through some very fast use in the last year since the dent and it's rock solid. No one has ever seen the dent as the can covers it up and I have long forgot about it. I would go get the bike if I were you. I am more interested in how the owner took care of it, the value of the aftermarket upgrades, if it's been stored inside and how many miles it has. $4,500 to have that bike in your garage is a very good buy. Now if you want to upgrade to RSVR status expect to pay at least $5,500 - $6,500. Don't even think about buying that bike and wanting to upgrade the suspension to Ohlins spec. It takes a lot of time and $$ searching for the parts and swapping them out. Trust me I did it, but I like tinkering and setting things up. 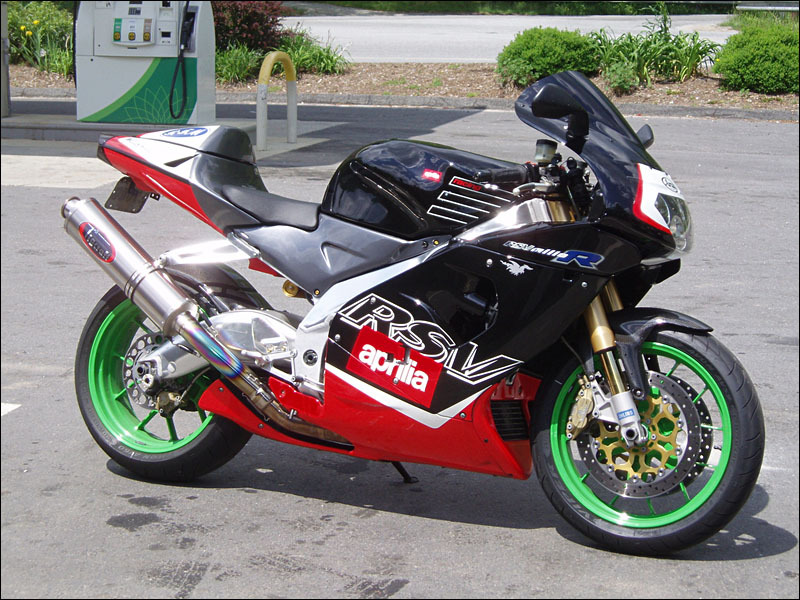 Yeah I've seen RSV's for less than 5K but they have ALL been beaters and high mileage except for the one I found.